In the fourth article of this ongoing analysis I looked at the performance of calls made by individual Bloggers who form part of the TickerSense Blogger Sentiment Poll. As in prior analysis, a successful bullish call was considered to be a gain greater than 1%, a bearish call a loss of 1% and a neutral call fell between +1 and -1%. S&P returns were assessed on Monday's open price and a close 30-days later. The test period ran from April 14th to September 15th 2008 and was made up of 27 bloggers. The S&P had seven bullish periods, one neutral period and fourteen bearish periods over this time frame. The poll is usually run every week, but for three weeks in this period no poll was run. Crossing WallStreet, Information Arbitrage, Ahead of the Ticker, Controlled Greed, Infectious Greed, and In the Money had fewer than five returns so their results were more prone to extremes. The Bull / Bear column reflects the Blogger's net stance based on their individual returns; a blogger making all bear calls would score -100% and all bull calls a +100%, with everybody else falling in between. Daily Dose of Optimism ranked number one of participants across all four polling periods. Random Roger was next in the rankings with a very strong performance over the past two scoring periods. Interestingly, as noted by the Birinyi team, Random Roger returned a bullish call for the current Ticker Sense poll (Oct 13-17) - his first bullish call since the poll began in December 2006. It will be interesting to see how timely it is. 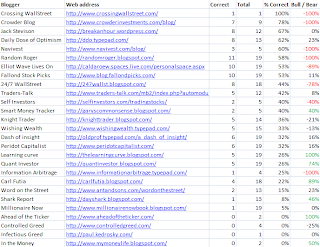 My market calls (personal opinion not the views of Zignals.com) had the greatest consistency with the lowest variance of the top-3 Bloggers from the poll with 24/7 WallStreet not far behind. Of the recent inductees, Crowder Blog, Traders-Talk and Jack Stevison have all scored well with accuracy averages over the past two periods of 72%, 53% and 59% respectively and are bloggers to watch over the coming months. 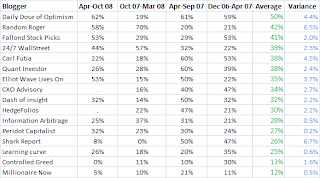 How have blogger perceptions of the market changed over time? In crude terms, the S&P since December 2006 has enjoyed one bullish period, one bearish period and two relatively neutral periods. On the Blogger side there was a gradual bearish drift for Daily Dose of Optimism. 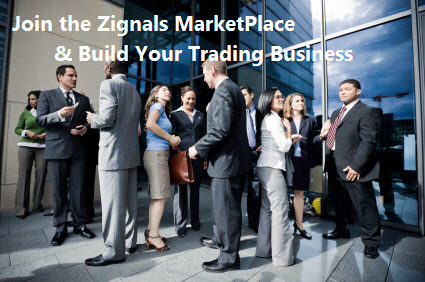 A sharp change in opinion from bullish to bearish was found for Elliot Wave Lives On and Information Arbitrage. 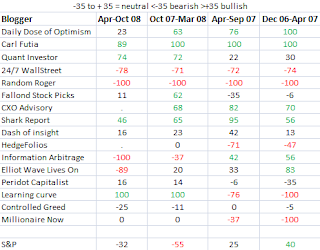 Millionaire Now and Learning Curve polled in the other direction with a shift from bearish to bullish, with a more gradual move from neutral to bullish for Quant Investor. Consistently bullish were Carl Futia and the Shark Report. Consistently bearish were Random Roger and 24/7 WallStreet. Based on absolute S&P performance since December 2006 to mid-September 2008 the market had more or less come full circle. Since then bears have hammered their advantage home, but it won't always be so. Has Random Roger made a prudent change of heart?